Major (Retired) Euell White entered the Christian ministry after retiring from the US Army where he served for 21 years, including three Vietnam tours. He served as Associate Pastor and Director of Counseling for an interdenominational church for 17 years. His earned degrees include a BS, ThM, and a PhD in Christian Counseling Psychology. He is licensed by the National Christian Counselors Association (N.C.C.A.) as a Clinical Pastoral Counselor and is board certified in Family and Adolescent Counseling. Dr. White is a Diplomate member of the National Board of Clinical Christian Therapists. This book is about the need for Christian counseling in the local church. 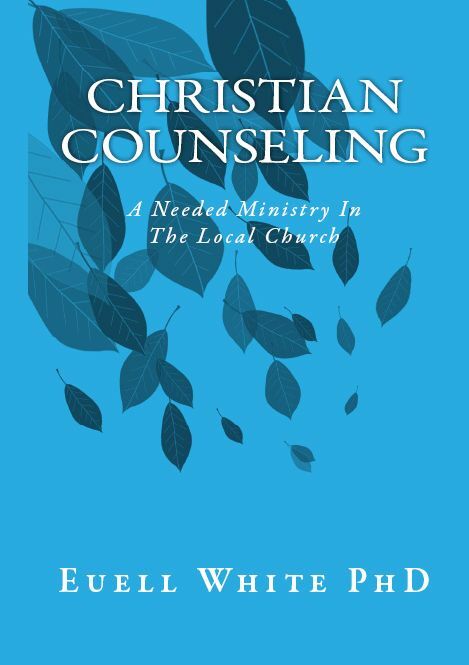 The author explains the contrast between Christian and secular counseling, concluding that secular counseling results in temporal help at best. He points out that most emotional problems have spiritual root, therefore require spiritual ministry. The goals of secular Christian and Christian counseling are contrasted. Some of the more common counseling issues are explained. These include hostility rejection, marriage pre-marriage and remarriage. Some of the techniques that the author used successfully in his counseling ministry are explained, and illustrated with actual case histories. These include Temperament Therapy and Theophostic Prayer Ministry. Some of the common obstacles the counseling ministry in the church are pointed out. These include church service orientation, an altar service myth, the clergy – laity division in the church, and a weak emphasis on discipling. Several non-Christian theories are examined, including Freud’s psycho-analysis, ego-psychology, humanistic existentialism, BF Skinner's determination, parapsychology and occultism. There are four facts that I consider fundamental to understanding the need for Christian counseling. The first fact is that any problem that hinders one from being all that God wants him to be is a spiritual one. I am often amazed by the commonly held concept that most of the things affecting our daily lives are non-spiritual. We are, in fact, spiritual beings as well as human beings. The Lord said that when we are born of the Spirit, we become spirit: "That which is born of the flesh is flesh, and that which is born of the Spirit is spirit." (John 3:6)...Paul wrote that "those who are in the flesh cannot please God. But you are not in the flesh but in the Spirit, if indeed the Spirit of God dwells in you. Now if anyone does not have the Spirit of Christ, he is not His." (Romans 8:8-9). Paul admonishes the Churches of Galatia: I say then: Walk in the Spirit, and you shall not fulfill the lust of the flesh. (Galatians 5:16). I believe that any inordinate fear or other emotion that has control over one's life and limits his activities is a spiritual problem. Any counseling that does not recognize the Lord Jesus Christ as the solution to problems must be considered non-Christian, despite the fact that the counselor professes to be a Christian. Some Christians who are in counseling use the tools of the flesh rather than the Word of God. The fact that one has a Bible in his office does not make his counsel Christian. It is the authority or degree of authority the counselor gives to the Bible that makes the difference. The goals of counseling always reflect the counselor's perception of the problem. If a counselor believes, as did Dr. Eric Berne, that actual security does not exist and that what people are seeking is only feelings--his goal will not be to help the person find real peace and security, but to help him feel better or to condition him to live without the desired feeling. The problems being presented in the present are rooted in the backgrounds of the two individuals in a marriage. The marriage, therefore, cannot be healed until its two parts are healed...I often use the illustration of the power train of an automobile. The power train consists of the engine and the transmission. The engine generates the power to drive the car, but it is transmitted to the wheels by the transmission. If it is not working, the mechanic cannot fix the power train as a whole without recognizing the two components. He fixes the transmission or the engine, whichever is dysfunctional. In marriages it is almost always both that need fixing. Those who marry on the "rebound" trying to find healing from the hurts of another failed relationship, find instead, bitter disappointment. Understanding the temperament can be very valuable for parents in raising their children. Often parents are determined to treat each child the same, which is usually a mistake. Certainly each child should be treated fairly, but since each child has his own unique temperament they don’t need to be treated the same. Theophostic prayer ministry involves finding the lies that a person has believed and exposing them with the truth. There is an attitude that is all too popular, that individual ministry is not needed in the church if the "services" are good. I call this the Church Service Orientation. Psychotherapy encourages a person to grow stronger and more independent. God's way, in contrast to psychotherapy, is for us to become weaker and more dependent on Him.